If you’ve ever wanted to own one of the slick cars most people only ever get to drive in video games, now is your chance. And you don’t even have to be rich or going through a mid-life crisis. Gameloft is holding a contest for players who download Asphalt Audi RS 3. 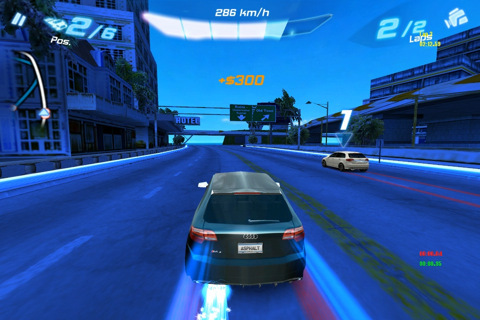 The free game, which is actually a demo based on Asphalt 6: Adrenaline, gives players the opportunity to win an actual Audi by downloading the game and entering a competition on Gameloft LIVE! between the 3rd and 16th of March. The demo allows you to take a virtual Audi RS for a test drive on two tracks, one in the Bahamas and the other in Tokyo. The competition takes place on the Bahamas track. The player that completes the track with the fastest time will be the winner. An Audi A3 Sportback 2.0 TFSI quattro (200 HP) vehicle, which includes the following features: S line sports package, S line exterior package, S tronic (automatic transmission), quattro (4 wheel drive), Perforated leather / alcantara upholstery with embossed S line logo, 18 inch aluminum wheels, Xenon plus headlights, Panorama sunroof, Privacy glass, Navigation system, BOSE Sound System, Audi music interface, Audi magnetic ride, Acoustic parking system, and Electric Climate Control. The German gross list price is € 49,950 Euros [note: in dollars this is about 70 grand!]. If this prize is not available at a dealership in the Grand Prize Winner’s area, an Audi vehicle of comparable value will be awarded. After downloading the Asphalt Audi RS 3 Application, visit the Contest link from the main menu of the application to log into your Gameloft LIVE! account. If you do not have an account, create one at Gameloft.com. Creating an account is free. During the contest period, Participants can try to achieve the best time they can on three (3) laps of the Bahamas track. The fastest times achieved will be uploaded to Gameloft and count as your entry into the contest. By entering the contest, you agree to all the Official Rules of the contest. Gameloft has sole discretion to disqualify any Participant it believes does not comply with these Official Rules. The demo features a career mode, so you will be able to practice before you enter the competition. You can view the rest of the details here.